Dr. Carl Balita, a former professor and dean of nursing and owner of a famous review center, has expressed his disappointment and echoed the sentiments of fellow Filipino nurses over Aquino’s decision not to approve the increase in the minimum pay of nurses in the country. 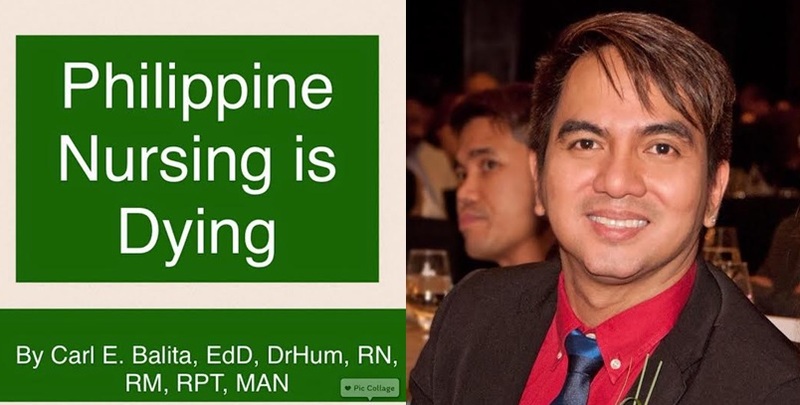 In his viral Facebook post that has amassed almost 17,000 shares as of this writing, Balita said that despite the global demand for Filipino nurses, the nursing profession in the country is dying. “The opportunities for Filipino nurses are vast overseas and its value to our economy is exponential. But we have lost the battle and the war, not because we lack the supply of nurses but because of our government's failure to see it from the global and local points of view,” he wrote. Balita then raised a number of issues as to why the Philippine nursing profession is in critical condition. According to Balita, there is underutilization of nurses in the Philippines leading to poor health care service to Filipino patients. Instead of the appropriate DOH ratio of 1 nurse to 10 to 15 patients, a Filipino nurse has to deal with 40 patients at the very least. The nurse advocate also mentioned that because of the limited job opportunities in hospitals, Filipino nurses are not able to meet the required experience to work abroad. As a result, many nurses are willing to work for free just to gain a certificate of employment. Balita also emphasized that the salary received by nurses in the country is way below what was indicated in the Philippine Nursing Law in 2002 due to lack of implementation by the government. Because of the low salary, nurses try to look for opportunities in spas, skin clinics and even call centers. Some even end up changing careers. Moreover, Balita said that there is poor utilization of nurses in the country. According to him, nurses are not given opportunities in areas where they can be most useful such as public health, schools and occupational health. Balita also pointed out that the decline in enrollment in nursing colleges is one of the reasons why Philippine nursing is in critical situation. The disunity for nurses’ cause, according to Balita, is also one of the factors that is killing Philippine nursing. He cited that Ang Nars partylist failing to get a seat in the Congress and nursing groups not being able to convince the Malacañang to approve the Comprehensive Nursing Bill are some of the situations that prove disunity among nurses in the country. “As the country awaits for change with President Rody Duterte's phenomenal assumption of the highest post, and with his common-law wife Cieleto "Honeylet" Avancena who is a nurse, the Philippine Nursing may be ressurected from the critical stage of dying, and that the nurses may be given the attention and recognition they have long deserved,” Balita wrote.